Andújar C, Arribas P, Ruzicka F, Crampton-Platt A, Timmermans MJTN, Vogler A (2015) Molecular Ecology 24: 3603-3617. High-throughput DNA methods hold great promise for the study of taxonomically intractable mesofauna of the soil. Here, we assess species diversity and community structure in a phylogenetic framework, by sequencing total DNA from bulk specimen samples and assembly of mitochondrial genomes. The combination of mitochondrial metagenomics and DNA barcode sequencing of 1494 specimens in 69 soil samples from three geographic regions in southern Iberia revealed >300 species of soil Coleoptera (beetles) from a broad spectrum of phylogenetic lineages. 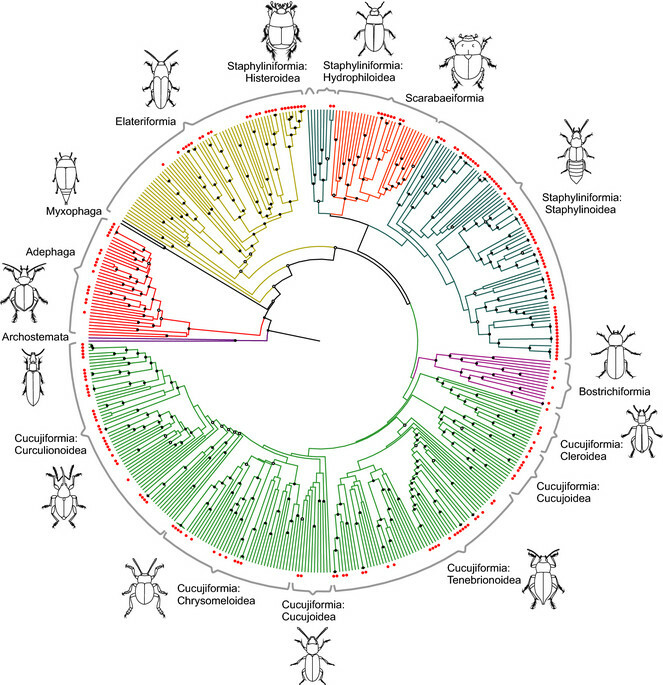 A set of 214 mitochondrial sequences longer than 3000bp was generated and used to estimate a well supported phylogenetic tree of the order Coleoptera. Shorter sequences, including cox1 barcodes, were placed on this mitogenomic tree. Raw Illumina reads were mapped against all available sequences to test for species present in local samples. This approach simultaneously established the species richness, phylogenetic composition, and community turnover at species and phylogenetic levels. We find a strong signature of vertical structuring in soil fauna that shows high local community differentiation between deep-soil and superficial horizons at phylogenetic levels. Within the two vertical layers, turnover among regions was primarily at the tip (species) level, and was stronger in the deep-soil than leaf litter communities, pointing to layer-mediated drivers determining species diversification, spatial structure and evolutionary assembly of soil communities. This integrated phylogenetic framework opens the application of phylogenetic community ecology to the mesofauna of the soil, among the most diverse and least-well understood ecosystems, and will propel both theoretical and applied soil science.